Earlier in the year I took the Organix No Junk challenge which you can read about here. I am delighted to say that Organix are continuing their No Junk campaign throughout the year and I will be covering the topics in various blog posts and recipes. This is a campaign that I am passionate about. Since having children food has become a focal part of family life. Meal time is quality time that we all get together. I am a true believer in the saying "a family that eats together, stays together". Summer time and holidays are the perfect time for picnics. Not only are picnics a great way to enjoy the great outdoors, eating good food, it is also a fantastic way to save some valuable money! At this time if years it is only fitting that the campaign focuses on picnics. As we are going away next week this has also been a huge point of my food planning whilst away. It will work out expensive if the 5 of us need to eat out everyday so we will be relying on picnics for lunch. As we will be away from home I will not be baking bread but will be buying freshly made bread as opposed to mass produced bread which contains many more ingredients than necessary. Our sandwich fillings will include cheese, meats and salads. While snacks will include crunchy veg sticks and breadsticks with dips. We all know that crisps go perfectly with picnics so we will be having traditional potato crisps and Organix snacks for the children. Organix have a wide range of healthy snacks that are ideal to to take out on picnics. I hope you will be continuing with the No Junk campaign and later in the year I will be sharing Halloween No Junk ideas which will be followed by Christmas! 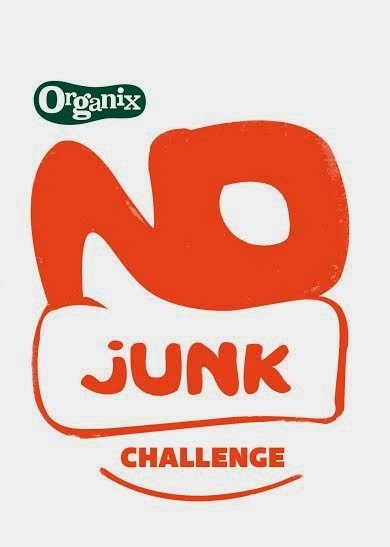 You can find out more about the Organix No Junk campaign here. Disclosure: I received some Organix products as a thank you for supporting the No Junk campaign. This is a campaign that I truly believe in and no payment has been received. All views and opinions are my own and 100% honest.